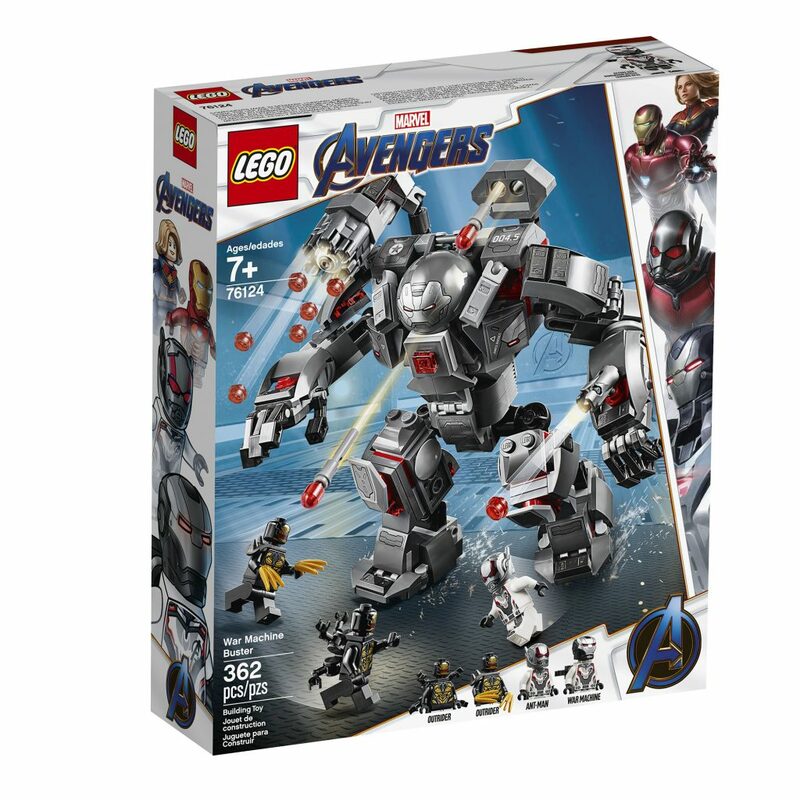 LEGO has just announced that they have launched five construction sets based off of the highly anticipated Avengers: Endgame movie. The construction sets see our favorite heroes in various scenes inspired by the movie. Let’s check out the new LEGO construction sets! We should warn you, these sets and descriptions contain potential spoilers for Avengers: Endgame. 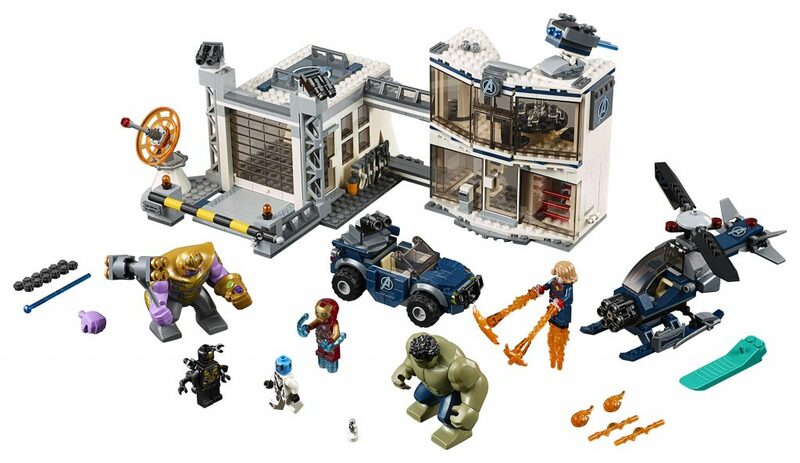 This buildable superhero playset includes 4 Marvel Universe minifigures: Iron Man, Captain Marvel, Nebula and a 4-armed Outrider, plus poseable Hulk and Thanos big figures and an Ant-Man microfigure. 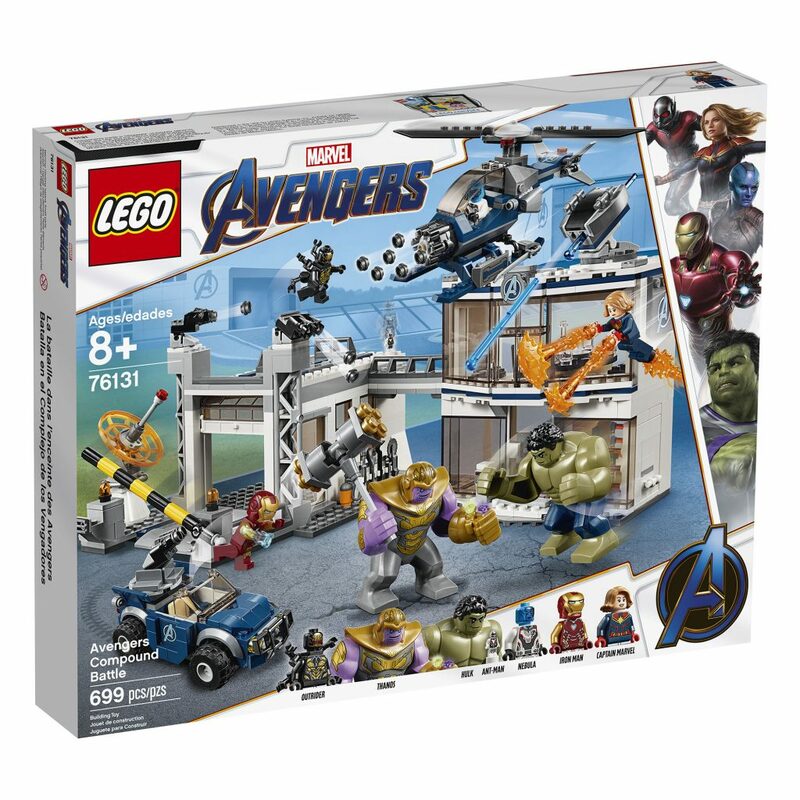 The set features the Avengers compound with a 2-level office building, helipad, garage, plus a helicopter and offroader for creative play. Weapons include Nebula’s sword and Thanos’s buildable, double-sided battle axe. 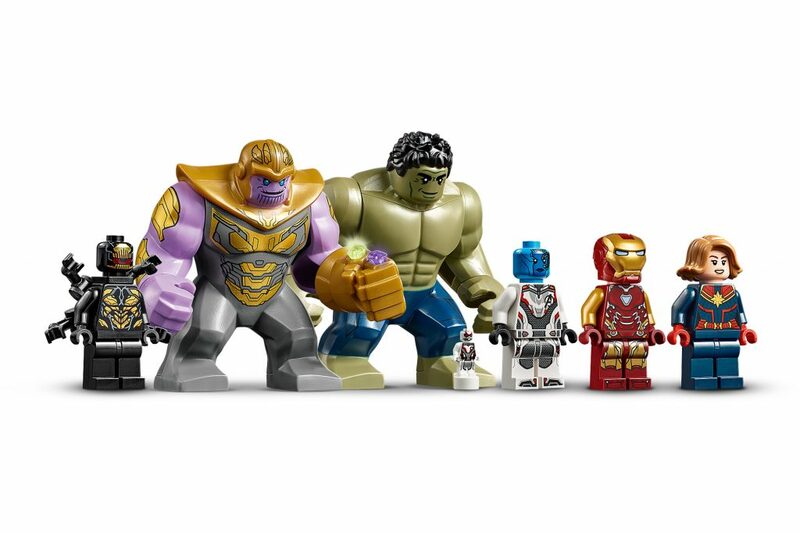 The Iron Man minifigure and Thanos and Hulk big figures are all new for March 2019, and the Nebula minifigure and Ant-Man microfigure each feature new-for-March-2019 Avengers team suit decoration. 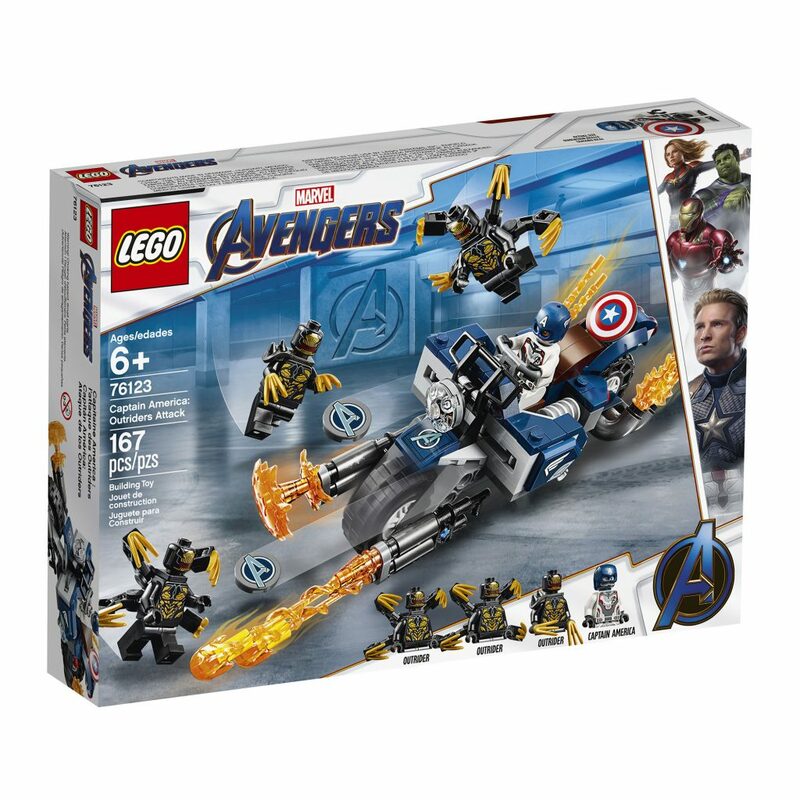 Captain America’s bike features a minifigure cockpit, 2 Captain America shield shooters, front wheel with detachable non-shooting blasters, attachment points for minifigures, fold-down bike stand, headlight element and an exhaust flame element. 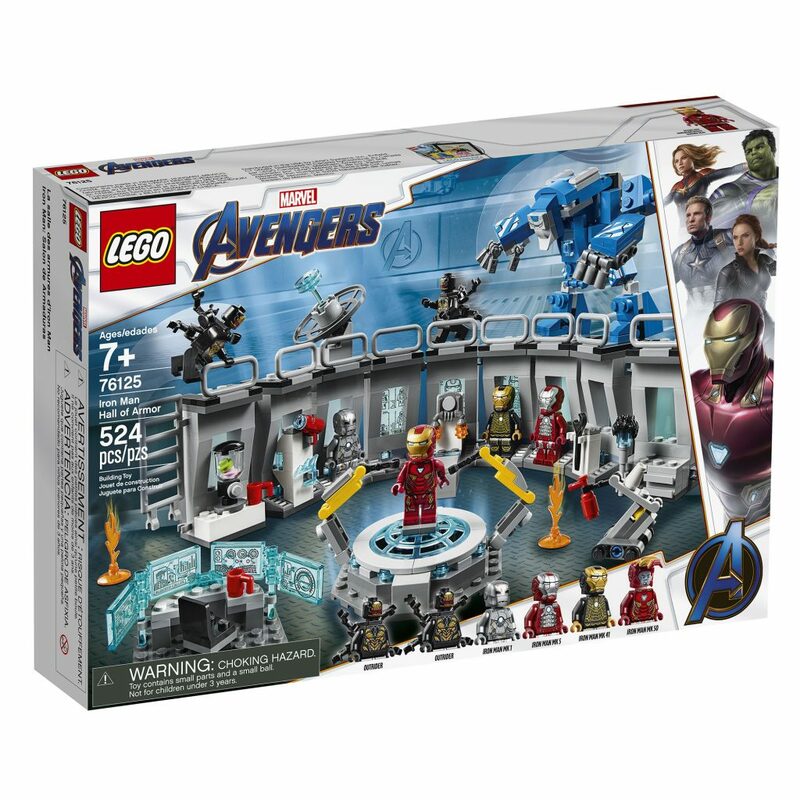 This superhero playset includes Captain America’s new-for-March-2019 helmet element and Avengers team suit decoration. 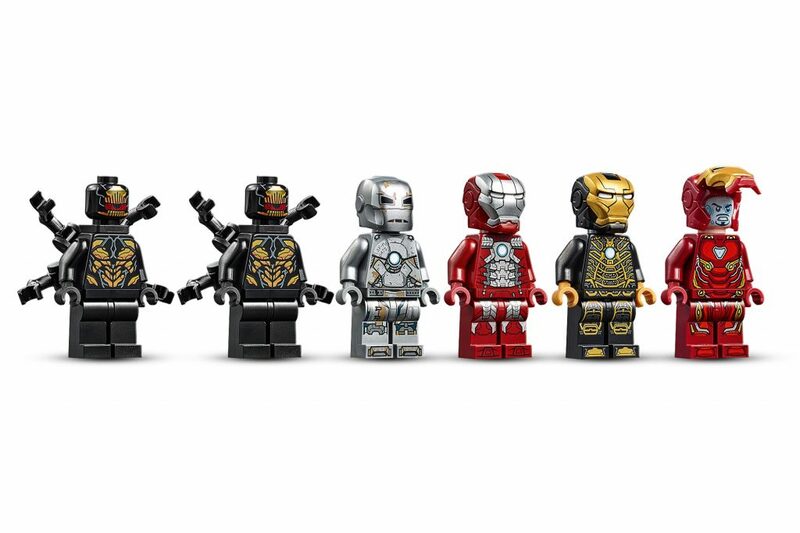 Includes 5 Marvel Universe minifigures: Iron Man MK 1, Iron Man MK 5, Iron Man MK 41, Iron Man MK 50 and an Outrider. 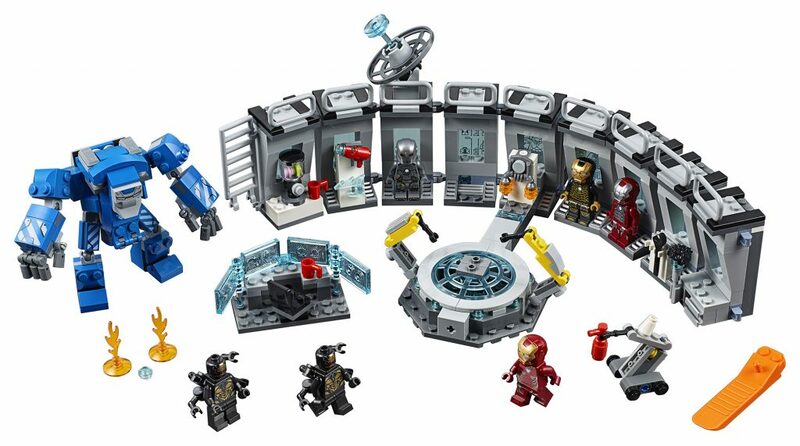 Iron Man lab includes: a rotating podium with 2 posable robotic arms; desk with translucent-blue screen, minifigure chair and cup elements; kitchen module with a buildable smoothie maker and cup element; weapon storage module with a stud shooter, power-up jetpack and energy beam element for the minifigures; tool storage module with a wrench; modules to store Iron Man suits; radar dish; safety barrier elements; fire extinguisher and 2 flame elements. Connect modules into a circle to create a screen room or a prison for the bad guys. 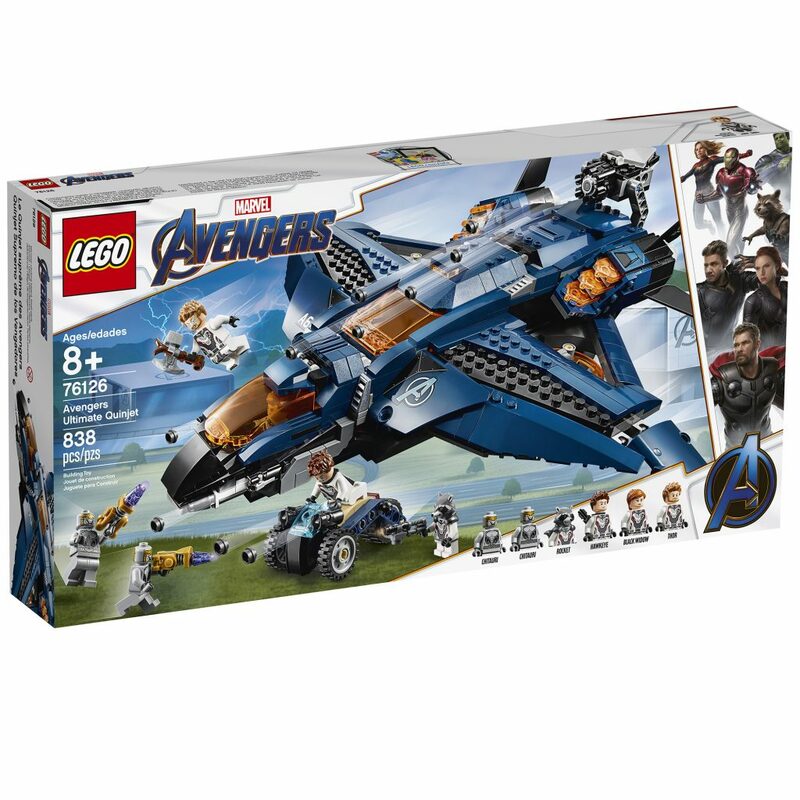 Get set for a battle against the Chitauri with the Avengers Ultimate Quinjet! Prepare the weapons with Rocket and Thor in the passenger compartment. Jump in the cockpit with Black Widow and take off. Fire the stud shooters and the 6-stud rapid shooter. Make a smooth landing and continue the fight on the wings. Then surprise the enemy with the stud-shooting trike! 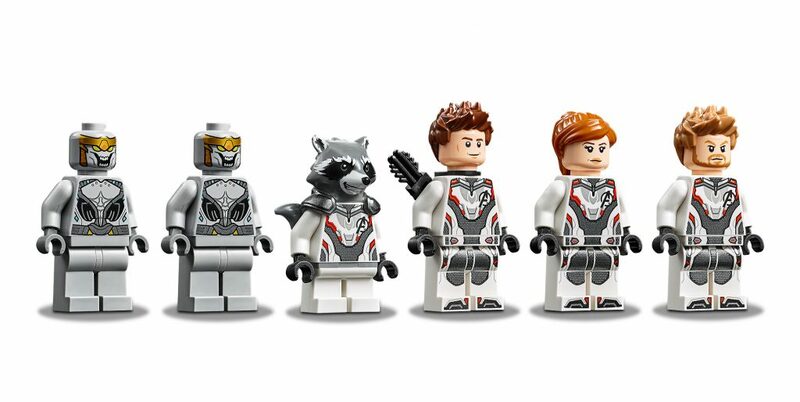 This playset includes 6 new-for-March-2019 Marvel Universe minifigures: Black Widow, Hawkeye, Rocket, Thor and 2 Chitauri. 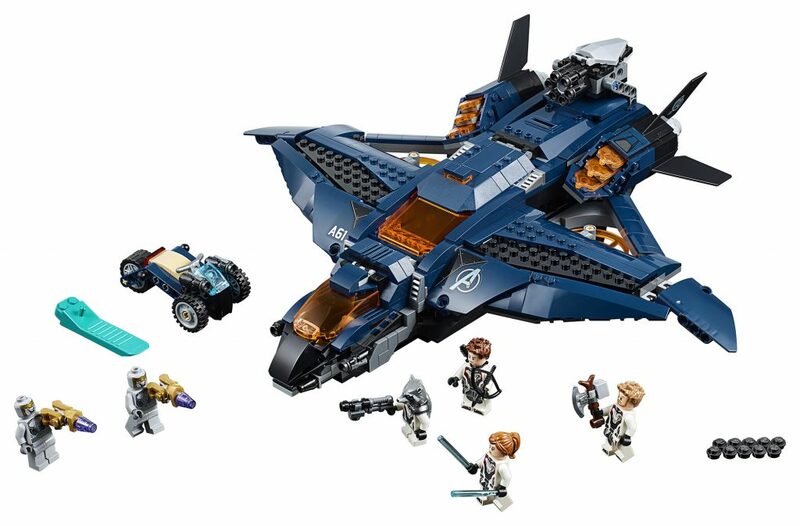 The Marvel Ultimate Quinjet model features an opening minifigure cockpit, 2 stud shooters, opening passenger compartment with 2 minifigure seats and weapon racks, opening rear compartment with fold-out 6-stud rapid shooter and trike, adjustable wings and spinning rotors. Weapons include Black Widow’s 2 energy sticks, Hawkeye’s bow & arrow, Rocket’s gun and Chitauri’s 2 blasters for imaginative play. 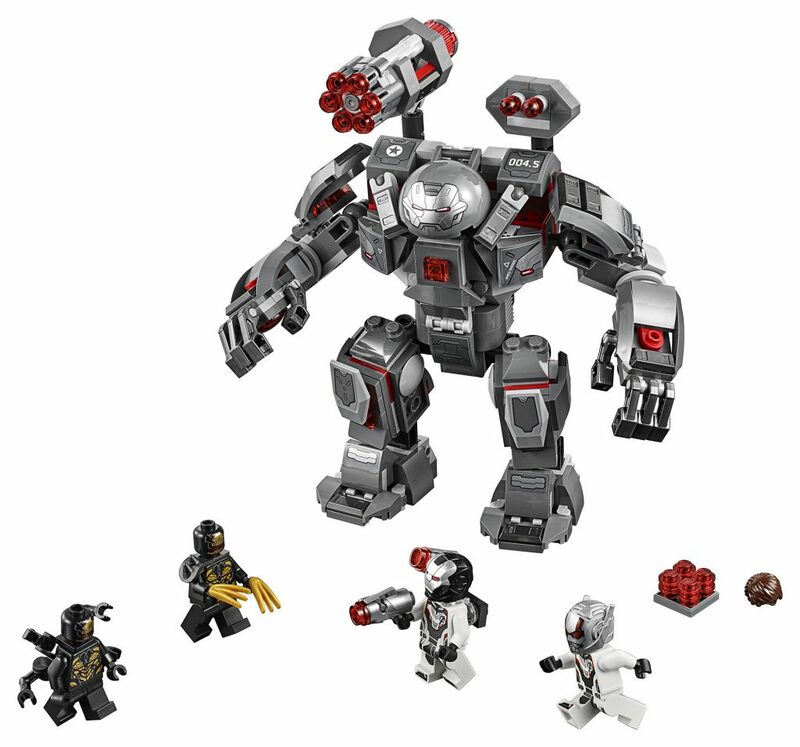 War Machine Buster mech features an opening minifigure cockpit, 6-stud rapid shooter, 2 detachable stud-shooting cannons, 2 flick missiles, posable arms and legs, gripping hands and an opening storage compartment for extra ammo. 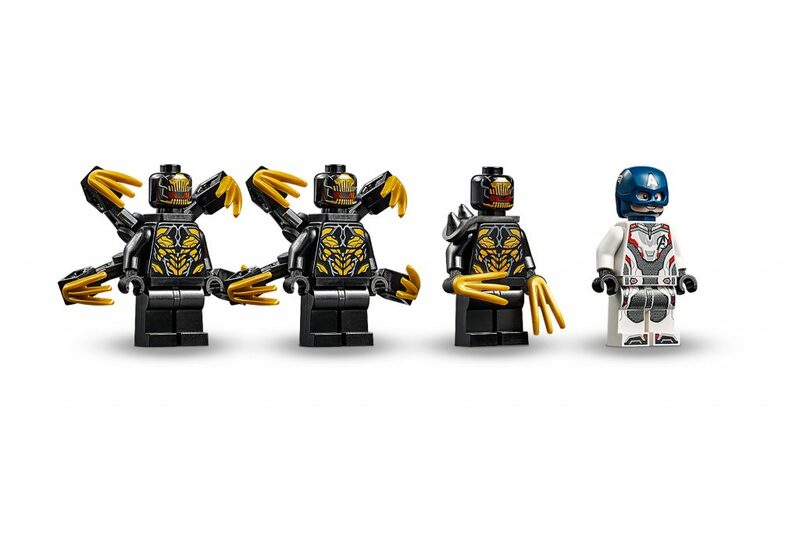 This buildable superhero playset includes 4 Marvel Universe minifigures: War Machine, Ant-Man and 2 Outriders.